KYAUK HTET VILLAGE, Shan State — Until a few years ago, the farmers in Kyauk Htet Village paid little attention to the wild bees that were living around them in the farm fields, fruit trees and forests that cover the rolling Shan Hills in Kalaw Township. “In the past, we only ate bee larvae and destroyed the natural bees’ nests in the forest to take out the honey. 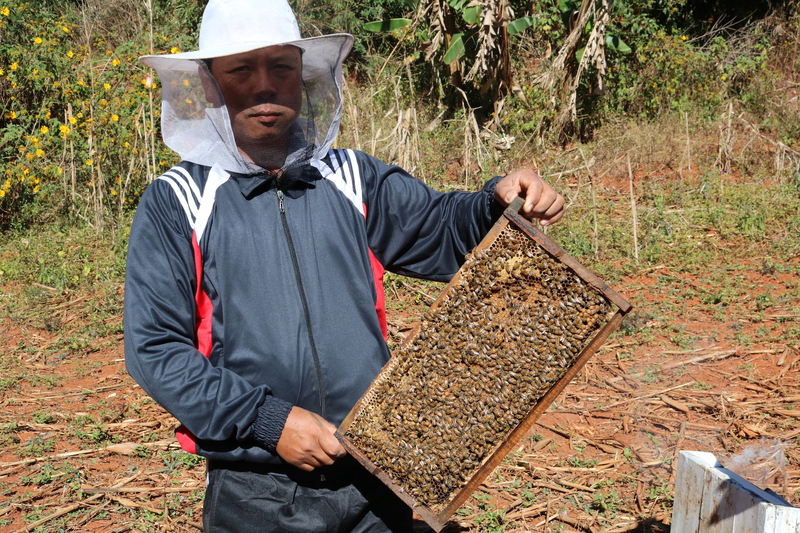 But after we attended a training course we realized bees are beneficial insects,” said Zaw Myo Thein. Now, he and hundreds of other small farmers in southern Shan State have boosted their income through apiculture and they are trained—and enthusiastic—beekeepers. “I had no interest in this business as I was very afraid of bees. However, after the training course I got familiar with the bees and I’m no longer afraid and can make money from this business,” Zaw Myo Thein said, adding that he earned almost US$1,000 from honey sales last year. San Win, secretary of the Beekeeping Business Association of Shan State, explained each hive has around 30,000 workers and one queen who live off the flowers in nearby fields. He said most bees in Shan State make honey collected from the nectar of flowering plum trees, adding that when there are few flowering crops and trees, keepers feed their colonies syrup. San Win, who keeps 400 beehives, said a kilogram of honey fetches around $0.75-$1.00 at the farm and each hive can produce up to 400 kilograms annually, while it costs about $60 to maintain a hive. Implemented by the non-governmental organization TAG, the project began training farmers and providing beehives in 2013; it also supports the honey market chain development in Burma. Plan Bee has worked with the Ministry of Agriculture’s Apiculture Enterprise to train about 500 farmers in 20 villages in five townships in Shan State, an area home to poor Shan and Pa-O villagers. Beekeeping provides a number of benefits beyond income from its relatively high-value product: honey. “Bees are agents that support agriculture by carrying pollen,” Zaw Myo Thein noted. 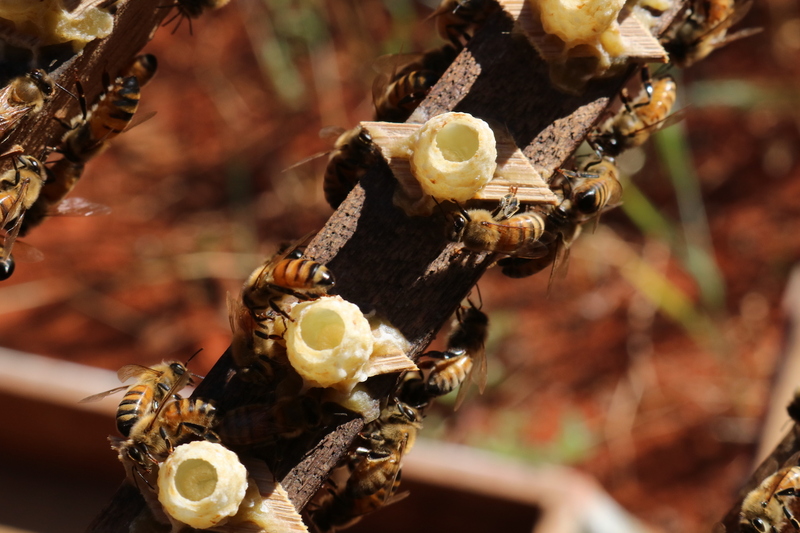 Beehives also produce wax that can be used to make other products, such as candles, while honey has nutritional value for local households, according to TAG’s project website, which added that beekeeping requires little space, making it accessible for landless families. Last year, Burma had more than 950 registered beekeepers with almost 150,000 hives, mostly located in the central regions. These produced around 4,500 metric tons of honey, some three-quarters of which is destined for export largely to other Asian countries, according to the government’s Apiculture Enterprise. The number of beekeepers and hives has roughly doubled in the last three years. Burma has much potential to further expand its honey production, but should improve its hygiene and processing standards in the production process in order to expand access to global markets, such as the United States, said Tin Maung Kyi, of Plan Bee. China is the world’s largest honey exporter, and in Southeast Asia, Vietnam is a major producer, which earns around $132 million from annual honey export, according to international trade statistics. A LIFT-supported workshop on honey production in March 2016 highlighted great expansion potential for Burma, as well as hurdles and risks to growth. Experts pointed to an urgent need for better government regulation of the growing use of chemical pesticide and fertilizer in Burma, which threaten bee populations. Another problem is the decline in global honey prices and demand in recent years, which has also brought down prices for beekeepers in Burma. “The demand is quite cool this year, although I still shipped out about 500 tonnes of honey last year,” he said, adding that Burma struggled to compete with low-priced honey from Vietnam. “Myanmar honey’s quality is quite good, but foreign merchants prefer lower priced honey for their profits. Only if the United States cannot buy more honey from Vietnam, they try to purchase from our market,” he said.